With this warm weather still lingering you may not be considering Christmas decorations quite yet… but once you see the 2013 Swarovski Holiday collection you will reconsider! This collection features the 2013 Annual Edition Swarovski Ornament and the first addition of the 2013 Swarovski Christmas Ball Ornament. The sparkling crystals in each of these ornaments are sure to bring the Christmas spirit into any home. 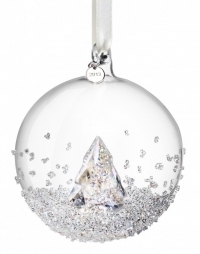 The Christmas Ball Ornament is a clear glass ball decorated with beautiful crystal snowflakes with a seasonal tree and a Silvertone 2013 hang tag. This ornament will be the perfect gift for any Swarovski collector or someone celebrating a special event in 2013. The 2013 edition of the Annual Swarovski Snowflake Ornament is very delicate and refined, handcrafted with the world’s finest clear crystal. The snowflake hangs from the traditional white satin ribbon with the Silvertone 2013 hang tag. This piece is another perfect addition for any Swarovski collection. 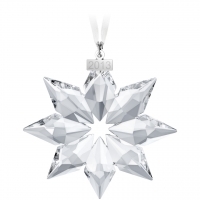 There is also a smaller version, the 2013 Swarovski Little Star Ornament. FX Dougherty Home & Gift will be receiving this collection at the end of September. Complimentary gift wrap will be available with free shipping on orders over $150. Don’t miss out on these pieces which are sure to add sparkle to your holiday decorations!